1. DASHBOARD – The dashboard is the place where you will be able to activate the plugin the first time you use it. After you activate the plugin on the dashboard you will have a few shortcuts for other modules in this plugin. 2. PLUGIN OPTIONS – Here is the place where you will be able to customize the way the plugin functions. You can find out more on the configuration section in this documentation: Plugin Options. 3. 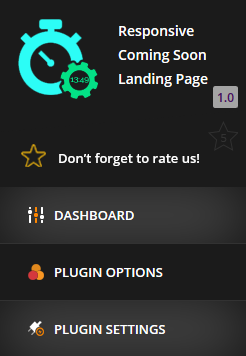 PLUGIN SETTINGS – Is the place where you can see the modules that this plugin is using, Back-up or restore the settings of your plugin and in case you need our help, open a ticket for us.